As always an exceptional commentary. Living in Texas we have more of a “fixed” climate. However, seasons change here too! This has been a colder winter with big weekly variations in temperature and sunlight. Truly it impacts everyone’s outlook. I love your big picture thinking about how change happens and how we adjust to this. Spring will come soon here too and we will all be grateful. This has been a crazy winter, hasn’t it? Even for you! These are huge changes, how could it NOT alter our perspective? Fortunately, time is not only a healer, it’s an ongoing process that refuses to stand still. So with great anticipation and glee, I look forward to “springing forward” to Spring and warmer temps, longer days 🙂 Forward motion to March! I am definitely affected by the weather, but I don’t think I’ve EVER longed for winter. I’ll have to pay more attention to that this coming summer (which I AM longing for). I concluded a few years ago that autumn is my favorite season. 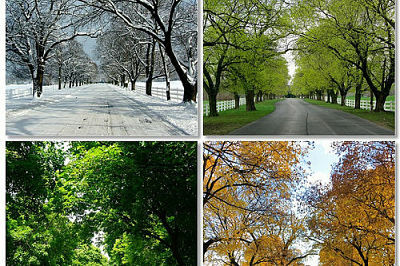 Summer and winter are often too extreme, and spring can be cold and rainy, but autumn is usually sunny and mild. I used to see it only as the gateway to winter, but now I appreciate it for its real beauty. In addition, as we are transitioning from the more leisurely pace of summer to the structure of fall activities, it makes more sense to implement changes at that time than at New Year’s. I agree with you Janet, my favorite seasons are Spring and Fall. I love both of those transitions. They both awaken me and motivate and am grateful for their beautiful qualities. The “extreme” seasons are harder to tolerate in either case, they absolutely impact my attitude and productivity.